Papayas are a delightful fruit from the Carica tree which is commonly found in the Caribbean. The tree is native to the tropics of the Americas and was cultivated in Mexico several centuries before its emergence in the Mesoamerican classic cultures. It is originally from southern Mexico, Central America, and northern South America. Nowadays it is cultivated in most countries where the climate is tropical like Brazil, India, South Africa, Sri Lanka, and the Philippines. This fruit surprisingly goes by many names that include: Papol\Guslabu (Sinhalese), mamão, fruta bomba (Cuba), lechosa (Venezuela, Puerto Rico, the Philippines, and the Dominican Republic), and papaw (Sri Lankan English). The Carica tree is quite small and has a single stem that grows anywhere between 5 to 10 meters. It has large leaves that are 50 to 70 centimeters in diameter. The flowers are similar in shape to the flowers of the Plumeria, but are much smaller and waxy. They appear on the axils of the leaves and mature into the fruit that is 15-45 centimeters long and 10-30 centimeters in diameter. The fruit is ripe when it feels soft (like a ripe avocado or a bit softer) and its skin is amber to orange in color. It's taste is vaguely similar to the pineapple and peach. The fruit is rich in an enzyme called papain; a protease that is useful in tenderizing meat and other proteins. Its ability to break down tough meat fibers was utilized for thousands of years by indigenous Americans. Ripe fruits are usually eaten raw, without the skin, and without the seeds. The unripe green fruit is usually eaten in curries, salads, and stews after is has been cooked. In today’s markets, papain is added to powdered meat tenderizers and sold in tablet form to alleviate digestive problems. One word of caution that should be considered when harvesting papayas is that they tend to release a latex fluid when they are not ripe. This fluid can cause allergic reactions in certain persons. The black seeds are edible and have a sharp, spicy taste. They are sometimes ground up and used as a substitute for black pepper. The young leaves of the plant are often steamed and eaten like spinach in certain parts of Asia. 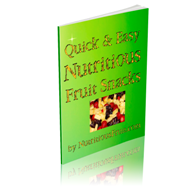 They contain vitamins A, C, E and K as well as folate, potassium and dietary fibers (1), (8). 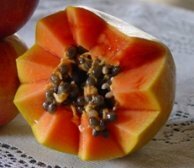 The fruits also contain the enzyme papain and an anti-helminthic alkaloid called carpaine, which can both be dangerous in high doses. In addition, consuming too many of them causes one’s palms and soles to become yellow. This condition, known as carotenemia, also occurs when too many carrots are consumed and is harmless. Fully ripe (mature) fruits are used to treat ringworm, while green ones control high blood pressure and are us as an aphrodisiac (4). 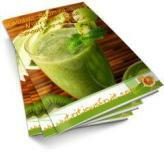 They can also be applied topically to treat skin ailments, especially sores (6). The seeds have anti-inflammatory and analgesic properties and are used to treat stomach aches and fungal infections. The leaves are often used to prepare a heart tonic, used to treat stomach aches, and used as an analgesic. The roots are normally only used as an analgesic (5). Women in India, Pakistan, Sri Lanka, and other parts of the world have for many years, used the fruit as a folk remedy for contraception and abortion. Medical research on animals has confirmed the contraceptive and abortifacient capability of the papaya and also found that the seeds have contraceptive effects in adult male langur monkeys. This effect may also occur in adult male humans (7). 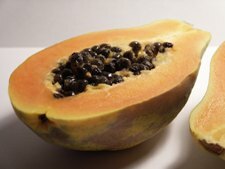 Research suggests that the effects of progesterone are suppressed by papayas phytochemicals (3). 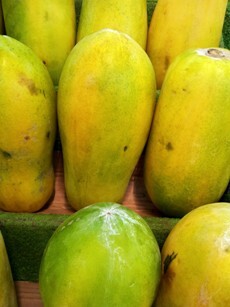 The fruit, however, is not teratogenic and does not lead to a miscarriage if small amounts of ripe papayas are consumed. Papain, the previously mentioned papaya enzyme, is also as a topical application in the treatment of cuts, rashes, stings, and burns (2). Papain ointment is commonly made from fermented papaya flesh and is applied as a gel-like paste(2). Harrison Ford was treated for a ruptured disc incurred during the filming of “Indiana Jones and the Temple of Doom” by having papain injected into his back. For this type of injury, unripe fruits are especially effective in large quantities or high doses. 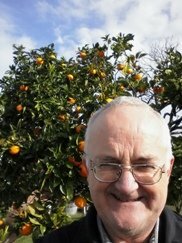 FactsAboutFruit.com. (2007) Papaya. 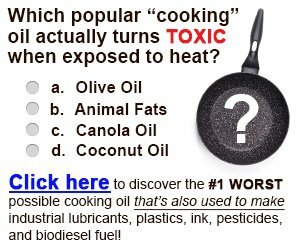 Retrieved on October 23, 2007 from http://www.factsaboutfruit.com/Papaya.html. Gopalakrishnan M, Rajasekharasetty MR. (1978) Effect of papaya (Carica papaya linn) on pregnancy and estrous cycle in albino rats of Wistar strain. Indian Journal Physiology and Pharmacology, 22(1):66-70. Hewitt H, Whittle S, Lopez S, Bailey E, Weaver S. (2000) Topical use of papaya in chronic skin ulcer therapy in Jamaica. West Indian Medical Journal, 49(1): 32-33. Lohiya NK, Manivannan B, Mishra PK, Pathak N, Sriram S, Bhande SS, Panneerdoss S. (2002) Chloroform extract of Carica papaya seeds induces long-term reversible azoospermia in langur monkey. Asian Journal of Andrology, 4:17-26. The George Mateljan Foundation. 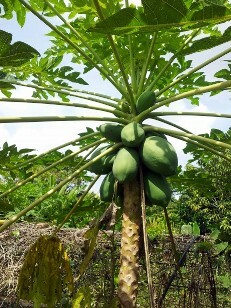 (2007) Papaya. Retrieved on October 23, 2007 from http://www.whfoods.com/genpage.php?tname=foodspice&dbid=47.